Community outreach is a process through which the university applies the knowledge acquired in the classroom to contribute to the improvement of the quality of life of families in Veracruz, especially in poor and marginalized sectors of society. Fostering collaboration and coordination among communities, civil organizations, and local, state and federal authorities represent one of the strategies the Universidad Veracruzana develops to contribute to local economic, environmental and social development. Fernando Melchor, a graduate of Agricultural Sciences, presently pursuing a Masters in Tropical Ecology, helps communities create a living with organic tomatoes. The project stems from the need to create additional jobs sources in the zone of Tlapala, Veracruz. Tlapala belongs to the municipality of Totutla; its economy, and the income of many families, relies on coffee production, but the citizens of Tlapala can only work during the harvest season. Melchor’s project is called “A Practical and Theoretical Course on Greenhouse Tomato (Lycopersicon esculentum Mill) Sand Farming Techniques and the Diversification of Coffee Farming with New Crops’’. I carried out my social service training with a group of people from the Tlapala region, constantly addressing issues of food sovereignty. I analyzed every single step it took to produce a crop, focusing on the sustainability and ecological networks that involves. One of the key points I told them was to adopt the idea of becoming agents for change, to be the founders of a business that might be the main source of food for their community in the future. This work helped me realize the value of the traditional knowledge of the Tlapala communities because I learned so many things from them that will benefit my professional life and future projects. Music Student’s Community Outreach Proves a Huge Success: An interest in music has now become a proud source of income in rural communities: Nanya and Carlomagno, studying for degrees both in Clarinet Performance and Musical Education, brought her skills to the communities of Tlapala and Calcahualco. I carried out both my social service and final year project in the Universidad Veracruzana’s community outreach program in the communities of Tlapala and Calcahualco. My project is called ‘Musical Training for Wind Instruments’ and started with a group of people interested in starting a band. At first they did not even have any musical knowledge, or instruments. However, they had the most important thing necessary for the study of music: the desire to learn how to play an instrument and form a band. Working off of their enthusiasm, I developed a program adapted to the aforementioned situation. I started them off with solfeggio and various musical appreciation workshops. The next step was working with recorders, smaller plastic musical pipes that resemble a clarinet. Throughout the process, I found the resources necessary to buy musical instruments by organizing raffles and sales to raise money. After a year and seven months, the members of the band ‘Realeza Musical’ (Musical Royalty), who make a living by farming and building houses, have acquired the basic abilities to continue developing their project and, even more importantly, have discovered all the benefits that a knowledge of music brings. Nowadays, the band has become a supportive team full of comradeship, commitment, and endeavor, each qualities they acquired during the project. The whole community has benefitted from the music and the bands’ experience. 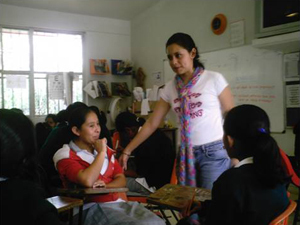 Hatziry García Zitácuaro, studying for a degree in Psychology, participated at the Tlapala UV House. My period of social service began with a visit to the community to meet the people we were going to work with and to establish a bond of trust with them. Along with other students, we carried out a diagnosis to choose the group of people to be attended to and the topics to be discussed. We found that secondary school students needed the most immediate attention, so a program was developed to fit their needs. The intervention program we helped design was called the Responsible Adolescent Workshop, which was proposed as a way of promoting a culture of responsibility in adolescents: responsibility, seen as a value and as an attitude in their relationship with themselves, society, and the environment. Values like self-respect and self-acceptance, personal maintenance and health, universal social values, education, and the recognition of the need for cultural and environmental care were all promoted during the sessions. One of the goals of this workshop was to develop an Individual Life and Career Plan, in which each student determined their personal goals, access to resources, socio-economic means, and strategies for success in four basic areas: personal, school, family, and society. 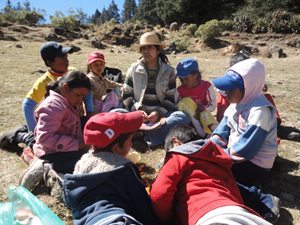 Cinthya Muñoz Zurita, studying for a degree in Nutrition, participated in a multidisciplinary team in the community of La Huaca. I spent my social service in the community of La Huaca, where we carried out activities aimed at improving health in the local population. One of the most important components of health is nutrition because it affects physical, mental, and social performance, as well as the rate of recovery from illness. In the town of La Huaca two nutritional problems were found: many people were overweight and obesity was common due to their diet and lifestyle. The criteria used to assess nutritional status were data collected through clinical, anthropological, and biochemical research, as well as nutrient consumption levles, and secondary criteria, which consisted of health and ecological statistics, including food distribution, cultural patterns primarily related to dietary habits, and economic situations. The actions employed to improve these problems were personalized nutrition consultations and talks on health promotion held monthly in different community areas, including information on diabetes mellitus, obesity, and osteoporosis, among other topics. Similarly, workshops were conducted on the development of soy-based dishes. It turned out to be possible that we were able to make people aware of the importance of improving their eating habits for a better quality of life. 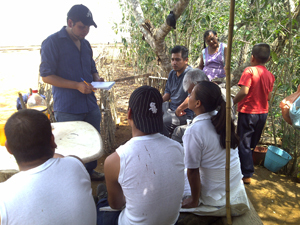 José Mauricio Cotlame Chimalhua, a dentistry student, was a member on a multidisiplinary team in Magdalena. 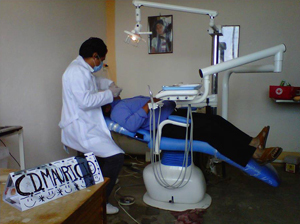 Programs on the prevention of oral diseases designed exclusively for the community of Magdalena, which has a high index of social marginalization and underdevelopment, were implemented during this social service project. Attention was given to the local population in a specialized room conditioned with basic dental equipment. Our team provides dental services to the members of the population that have not had access to them for lack of economic resources. The services offered focused on the prevention, treatment, and rehabilitation of oral the diseases afflicting the population. The main condition treated was tooth decay, which was present in 100% of people who visited the dental office. Other services included preventive dentistry, restorative dentistry, prosthetic dentistry, periodontal treatment, root canal treatments, extractions, and oral surgery. At the end of my experience, I was very pleased to confirm that my professional education and my time at the Universidad Veracruzana had finally paid off and that I am now a productive member of my society who is able to contribute in a small, but significant, way to the betterment of the population of Mexico to achieve the establishment of good dental health habits in the children of our future generations. For this community, the seed of good health habits has been sown and will now improve the level of personal care in the population. Paulina Ramos Tello, an Anthropology student, in Cempoala. My project involved a workshop called “The Importance of Maintaing the Ceramics Legacy of the Totonac Culture for the Children and Youth of the Town of Cempoala, Veracruz”. The main objective was to promote and foster the regional history in the children and youth of the community of Cempoala. Cempoala has an archaeological site and the project aimed to introduce the concept of cultural heritage, and thus lay the groundwork to create awareness for the protection and preservation of the archeological site and the dissemination of cultural heritage within this community. 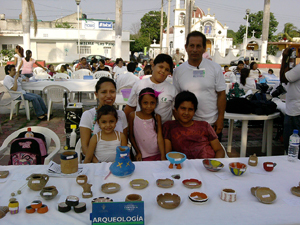 Clay pottery workshops were held for children and youth at the local School of Arts and Crafts, El Caracol. Workshop participants featured their creations in an “Arts Sale”. Other services were provided such as guided tours of the archeological zone in Cempoala. One of the most relevant projects at Conejo University House was the one carried out by Arely León Sánchez, a graduate in Spanish Language and Literature from the University of Veracruz. Her main interest is in the promotion and dissemination of the love of books and words, as well as sensitizing people to the care of, and respect for, the environment. In June 2011, the Pablo Neruda Library was inaugurated within the Carlos A. Carrillo primary School. Moreover, this year Arely made it possible that a book with stories written by the children called “Los Cuentos del Conejo” was published. All this work gave this project the opportunity to be awarded in recognition for “Fostering Reading and Writing in Educational Spaces” from the National Council for the Arts (CONACULTA). This successful experience will be applied in other communities and schools in Veracruz supported by the state Education Department.